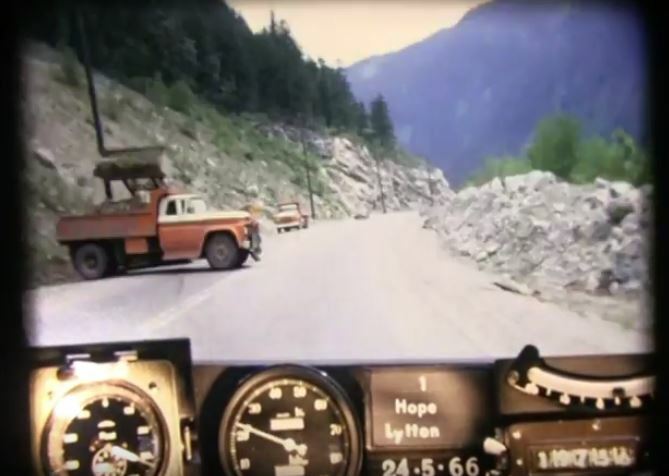 Hop aboard our BC Road Trip Time Machine and travel back to Highway 1, through the Fraser Canyon from Hope to Lytton, circa 1966. The significance of this road and its seven tunnels cannot be understated. In order to improve this portion of the Trans-Canada (the same general route used by the Royal Engineers to build the Cariboo Highway almost 150 years ago), some of the most difficult and expensive highway construction work in Canada had to be undertaken. Between 1957 and 1964, seven tunnels were bored through the Coast Mountains in order to allow the highway to pass through the canyon. Further major rock scaling projects were completed during 1974 – 1975 at Hell’s Gate and additional improvements (including new lanes) have continued since then. Another significant milestone can be seen at 4:28 minutes, as we cross the Fraser River on the new Alexandra Bridge. The bridge which had been recently completed in the early 1960s, replaced the Alexandra Suspension Bridge of 1926 (which can still be found just upstream). The new Alexandra Bridge was capable of carrying loads heavier than 35,000 lbs (the previous load limit) which meant that trucks could travel at legal loads through this section of Highway 1 – a huge boon to the commercial trucking industry in BC at the time. Highways Department trucks at work! We recorded these nostalgic videos (or photologs) from 16mm film footage taken in 1966. The original photologs were collected by rigging a camera onto the dash of a car that took still images every 80 feet or so and then running them all together as a single film. As far as we know, the “Highways Department” (as it was then known) was the first organization in Canada to collect information this way in order to create a visual record of road condition information from across the province, thereby allowing our engineers to study a stretch of road without having to travel there. Pretty cool, eh? If you’ve been riding along with us, you may have already toured the southern stretch of BC Highway 97, from the U.S. Border to Vernon, as well as the northern portion of 97 between Prince George to Dawson Creek and Highway 3A between Nelson and Balfour as it was in 1966. We have also driven over Vancouver Island’s Malahat Highway and along Highway 1 and the original Port Mann Bridge in our BC Road Trip Time Machine travels. Do you have any questions about this, or any of the other work we do? Let us know in the comments below. Stay tuned for more episodes in your special corner of the province as we work our way through the rest of the 1966 photolog footage. Thanks for the wonderful videos of some of the places I have traveled. I live in Harrop now and travel the road from Nelson to Balfour road frequently. I was looking at the one from Hope to Lytton and was wondering at what time frame the movie went through Boston Bar. I am looking for a motel that I worked in in the 60’s. It is long gone as I think it burnt down but I was trying to see if I could find a sign to see what the name of it was. If anyone could help please email me. Boston Bar is about 6:40 in the film. We had a look, but couldn’t see anything too clearly except for a Shell station. Perhaps a local Boston Bar forum might be a good place to ask? This video,although a little blurry, brought back soooo many memories! I lived five miles north of Lytton on Highway 12, from 1962 until I married in 1973, and although my parents have since passed away, my brother still lives on the farm. I have so many memories of that drive! In fact, my brother-in-law and his brother, Louis and Frank Pfenniger, owned Kanaka Bar! Kanaka became famous for the wonderful smorgesborg that Louis prepared every day, and the tour buses made Kanaka a definite MUST stop! It was never the same after Louis and Frank sold it! In 1973, I worked at Jackass Inn until I got married and moved to CFB Chilliwack with my soldier husband. From the time my family moved from Haney (now called Maple Ridge) to the farm when I was 7, until my little brother was about 10, dad would honk the horn continuously, or spradically, as we drove through China Bar Tunnel. Periodically, a train passing on the tracks below would toot back! I always wanted to stop at the Old Alexandra Lodge, and FINALLY did with my husband in 1975. They served the BEST hamburgers there, but I guess it’s closed now. I also finally took the occasion to walk across the old Alexandra bridge 38 years ago. It was pretty unnerving, with the open decking and full exposure to the rushing water of the Fraser River below!!! I bit the bullet and made it across and back, though! What wonderful memories! Thank you for sharing them with us. Your stories and enthusiasm for the film makes the work to produce these videos worth it. A trip down memory lane for me too. My dad travelled the canyon from 1961 to 1966 New Westminster to Clinton 8 times a month. As a young boy, couldn’t wait to go when school allowed. I was fascinated with the drive then when tunnels under construction and opening of the Alexander bridge which we came upon opening day and were briefly held up until official entourage made crossing to officially open. Every time I cross,that memory still pops up! I too attempted to walk the old bluffs used for tunnel construction but found then purposely destroyed and no acces ( safety reasons) Thanks For the wonderful video and look forward to more. Glad to hear you liked it Les! A lot more gas stations back then, the road doesn’t seem to have changed too much though. We will put it on the list Harry – stay tuned! Sounds like the improvements in the 60s were a welcome change! Thanks for sharing John and let us know if you find the old bluff location! Very interesting! Thanks for making this available. But your list of tunnel names is from south to north, not north to south. Glad to hear you liked it Bill. And thanks for the heads up on the list – we have updated it to say south to north. Having driven that route many, many times, I know the order of the tunnels is reversed. The order posted is from south to north. The Yale tunnel is nearly at Yale, not near Boston Bar. I’m sure I’m not the only one who, as a child, loved it when Dad honked the horn in the Alexandra tunnel, so we could hear the echoes. I still enjoy the drive through the Fraser Canyon. It is a truly beautiful drive and a wonderful piece of engineering. Thanks for connecting with us about the video. We love hearing everyone’s stories. 🙂 And thanks also for noting the north to south oopsie. It has been updated. The Fraser Canyon clip is by far the most impressive released so far. Having driven this road as a kid in the early 1970s, it really brought back memories of what the highway was like – as well as answer some questions while driving the modern highway of what some of the now abandoned and old buildings were like back in their day. Cannot wait to see what you have for the Thompson Canyon and Cariboo 97 northwards to Prince George. Thanks! Thanks for the positive feedback. We love these old videos and hearing from folks that they feel the same way makes it even better! We will look for your wishlist routes in our film and hope to release something from those highways soon. I remember this highway so well as we lived in North Bend until 1968 when we moved to the Kootenays. My father worked at the highways department in Boston Bar until he was transferred to the Kootenays. I remember the tunnels being built. The old Hells Gate tunnel was just cut out of a rock above where it currently sits. I remember going with my dad while they were building the tunnel and on weekends he would have to go down there and light these little pot lights so that the traffic knew where the road was. I also remember the opening day of the China Bar tunnel as the whole school got to go and attend the ceremonies of the grand opening. The roads were a lot narrower back in those days. It was fantastic to see what all the towns used to look like as I was watching the video I knew exactly where I was through the whole thing. Glad to hear you liked it Judy! I travelled this highway many times in my youth. I lived at Ashcroft, and made numerous trips to Vancouver, and in my early 20’s I hauled freight from Vancouver to Lilloet over this road. The video clip brings back many memories! Thanks for connecting with us and sharing your memories Alan. We love these old videos and hope to get more out very soon. This is wonderful – a trip down memory lane, growing up in Yale, School in Hope and moving to Boston Bar after married! i wish you had more….love these time capsules of our highway way back when! !